Bricks are made of clay, like terracotta. 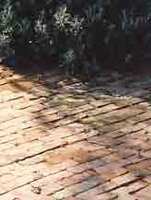 Hand made bricks have a varied surface texture, which cannot be replicated in machine-made bricks. They can also be made in any size. Lutyens liked 50 mm (2") thick bricks, instead of the standard 75 mm (3"). Hand made bricks may seem a luxury, but few gardens require a large quantity, and the cost of the bricks is not a large proportion of the brickwork cost. One soon forgets the cost, and the pleasure endures. If doing the brickwork oneself, the cost of first rate materials is easily justified. And it is very therapeutic to do one's own brickwork, as Winston Churchill found in the 1930s. "You are a perfect brick' is now an old fashioned compliment. It told of a personality that was strong, warm and kind. These remain the qualities of good bricks. Mud bricks, of the type used for the walls of Babylon, were made by shaping wet mud into blocks. They were dried in the sun and placed in position, sometimes with pitch in the joints. About 3000 BC it was discovered that when mud bricks are fired they become hard, as when clay is made into pots. The Romans became expert at brick making and brought the skill to Northern Europe. When they left, brick manufacture virtually ceased. Hard Roman bricks were salvaged throughout the Middle Ages to build chimney stacks and church spires. It is not easy to achieve high temperatures in a primitive kiln. Brick manufacture recommenced in England after AD 1200, but good-quality bricks were imported from Belgium and Holland for many centuries. Small hard Dutch bricks can still be found in the south of England . It is only in recent times that brick sizes have been standardized, and it has not been a benefit for garden construction. 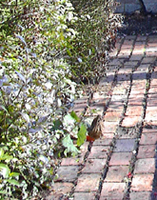 Bricks in stretcher bond, following the path direction.